Hello and welcome back. Celeste here with you for another Wednesday. Today I want to show you a card I made using the Eazi-Score, that Phyllis from Diamond Card Craft sent to the Design Team members a little while back. I used the score board and instruction booklet to make this Bouncy Card. I started off using purple card stock to make the card. Next I used some patterned paper to put on the bottom of the card and in the square. I cut out the Folding Fan from the same card stock as the main card and then used a shimmering purple to go over the fan itself. One flower using the Large Rose and Cuties 2 dies was used at the bottom. Lace Corner Deco A were used for the corners on the square of the card, while two of the other Lace Corner Deco A were used for the stand of the card. To add some "greenery", the Olive Branches were popped in behind the flower. On the stand of the card I used the Small Dragonfly with Angel Wing in one corner and the Darling Daisies in the other. Don't forget the challenge this week. 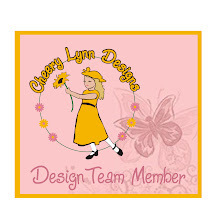 Head on over to the Cheery Lynn Designs blog for all the information and good luck! Hi Cheery Lynn Adorers! Celeste here with you for exciting news of the new releases of dies!! The Reflections Boutique Mega Dies are just fabulous. There are so many ways to use these dies you can't just stop at one! In my post today I have used the Horizon Covered Rectangle Mega Doily as the border for my little girl. I have cut out two sizes of this doily and popped them on top of each other with ribbon and lace before adhering to the bigger doily. This bigger doily is the Mini Pearl Covered Rectangle Mega Doily, and as you can see, I cut just one side of the largest doily to use as the background for my Mega Fanciful Flourish. You heard it right folks! A MEGA Fanciful Flourish. Loving this one!! Another of the new release dies is this Mini Flourish One, at the left of the above picture. I can see this becoming another hot favourite! And yes there is a mega die too!! These Lace Corner Deco dies are sure be a big hit. There are quite a few to choose from and the bonus is you get a set of three different dies in one pack. If you would love one of these new release dies, head on over to the Cheery Lynn Designs Blog and enter the current challenge for your chance to win a voucher. Hi every one and welcome back. Celeste here with you for another Cheery Lynn Designs Project. For a long time I have wanted to dress up a Tissue Box. I finally found one (from Kaiser) and got to work. I hope you like it! First I covered the whole box in neutral tones and then started with the borders. For the borders up the top, I used the Lace Light Deco Border and for the bottom with ribbon threaded thru, I used the new release Country Girl. Up on top I used the Queen Anne's Lace. Next the foliage came along. This was the Tropical Flourish and Olive Branches. I cut these out and inked with Tim Holts inks. The flowers were made up of the Miniature Rose, Large Rose and Cuties 2. These were put together and placed on the corner and two sides to look like a trail of vines and flowers. The Exotic Small Butterflies were added to the two sides. 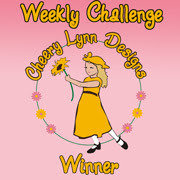 Please head on over to the Cheery Lynn Designs Blog for all the information on the current challenge.